School breaks are long and can feel even longer – for parents, for kids and especially for active kids. Mayfair offers kids camps during all school breaks, including summer camp, March break camp and winter camp. Known for our kids sports & tennis camps, we host a wide variety of camps full of fun activities and regardless of what camp they are enrolled in, all campers get to enjoy swimming! Mayfair Clubs Tennis Camp oﬀers your child a place to learn tennis from certiﬁed tennis professionals in a fun and motivating environment. We have camps during P.A. Days, March Break, Summer Break and Winter Holidays. Afternoons include recreational swimming, for a refreshing end to a fun-ﬁlled day. Download brochure. This year, ﬁll your child’s holidays with engaging activities! Your child will learn to play squash from certiﬁed professionals, in a safe and motivating environment. Afternoons at camp include recreational swimming, for a refreshing end to a fun-ﬁlled day. Download brochure. Join us for fun, engaging activities, friendship and lifelong memories! 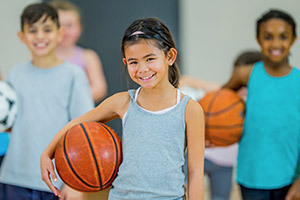 At Mayfair Parkway, our Sports Camp provides children with a wide range of organized sports games, including basketball, badminton, ﬂoor hockey, soccer, table tennis, volleyball, kinball and recreational swimming. Download brochure. Mayfair Clubs P.A. Day Camp offers your child a place to learn a variety of sports from certified coaching professionals in a fun and motivating environment. Afternoons include recreational swimming, for a refreshing end to a fun-filled day. Download brochure. Mayfair Clubs Tennis Camp oﬀers your child a place to learn tennis from certiﬁed tennis professionals in a fun and motivating environment. We have camps during March Break, PA Days, Summer Break and Winter Holidays. Afternoons include recreational swimming, for a refreshing end to a fun-ﬁlled day. Download brochure. This year, ﬁll your child’s holidays with engaging activities! Your child will learn to play squash from certiﬁed professionals, in a safe and motivating environment. We have camps during March Break, PA Days, Summer Break and Winter Holidays. Afternoons at camp include recreational swimming, for a refreshing end to a fun-ﬁlled day. Download brochure. Camp is focused on game fundamentals, skill development, sportsmanship and confidence in the game. Campers will participate in age and skill appropriate drills, play games and enjoy a daily swim. We offer a low camper to coach ratio, allowing kids to receive personalized instruction which is focused on the development of skills and having fun! Download brochure. Camp is focused on game fundamentals, team play and skill development. Campers will participate in age and skill appropriate drills, play games and enjoy a daily swim. We offer a low camper to coach ratio, allowing kids to receive personalized instruction which is focused on the development of soccer skills and having fun! Download brochure. This year, ﬁll your child’s holidays with engaging activities! We have camps during March Break, PA Days, Summer Break and Winter Holidays. Your child will learn to swim and strengthen their swimming skills with certiﬁed instructors, in a fun and motivating environment. Download brochure. Tiny Tots Mini Program is a half-day program for children between the ages of 2 to 5 years old. We have programs during March Break, PA Days, Summer Break and Winter Holidays. Children will enjoy skill building activities, such as cooking classes, squash clinics, fun games and creative time. Download brochure. Mayfair Clubs Golf Camp offers your child a place to learn golf from certified golf professionals in a fun and motivating environment. Afternoons include recreational swimming, for a refreshing end to a fun-filled day. Download brochure. Meet Dash, the next Olympic athlete! Help Dash complete feats of strength and speed. How did a lovable robot like Dash make it all the way to the Olympic games? Create a story using sequences of Dash’s rise to fame. Use functions to turn Dash into a Soccer and Basketball player. Compete against classmates in long jumps and 100 centimeter sprints. Come learn the skills to win a gold medal in robot sports! Soar through the history of flight, experimenting and building flying machines like the great inventors. Customize a gravity-defying stunt plane. Build rockets that blast into space. Invent your own wacky flying contraptions. Challenge classmates and soar higher and faster. Come fly with us on this creative, hands-on adventure! Mayfair Clubs Tennis Camp oﬀers your child a place to learn tennis from certiﬁed tennis professionals in a fun and motivating environment. We have camps during March Break, Passover, Winter and Summer Holidays. Afternoons include recreational swimming, for a refreshing end to a fun-ﬁlled day. Download brochure. Participants will have fun in our Advanced Tennis Camp as they develop their tennis skills. Our camp oﬀers your child a place to improve their game, as they learn from certiﬁed tennis professionals in a dynamic and motivating environment. We have camps during March Break, Winter and Summer Holidays. Afternoons include recreational swimming, for a refreshing end to a fun-ﬁlled day. Download brochure. Fill your child’s day with engaging activities! We oﬀer full and half-day programs where children will have fun playing sports, making crafts and swimming with their new friends. Our camps are designed for children aged 4 and up. Download brochure. Our camp programs provide a safe and fun environment for growth and development. Lead by our team of creative program leaders, Mayfair camps are designed to meet the needs of all levels of play for children aged 4 to 12. With careful consideration of children’s interests, this camp will ensure our participants have the best camp experience possible! Download brochure.